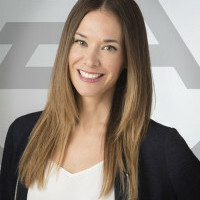 Jade Raymond is SVP and Group General Manager for Electronic Arts’ Motive Studios (Montréal, Vancouver), which she founded in 2015. Jade is also responsible for the HD Star Wars portfolio across EA. She is best known for helping create the Assassin’s Creed and Watch Dogs franchises, and for founding Ubisoft’s Toronto studio, which developed blockbuster titles like Tom Clancy’s Splinter Cell: Blacklist while under Jade’s direction. Jade has been passionate about games since her childhood in Montréal. 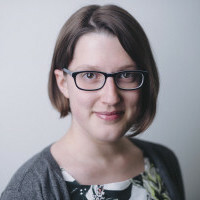 She joined the industry as a programmer and has since been focused on bringing innovation, new mechanics and gameplay to action-adventure and online multiplayer games. The worlds she has helped create have inspired novels and major motion pictures. In addition to serving on AIAS’ Board of Directors, she currently sits on C2 Montréal’s Board of Directors. This year’s Develop Vanguard Award winner Jade Raymond’s first job out of university was as a programmer for Sony, where she was part of Sony Online's first Research and Development group. From programmer to running her own studio, Jade’s spent her career working on game changing and innovating franchises like Assassin's Creed, Watch Dogs and Tom Clancy’s Splinter Cell: Blacklist. In 2015 Jade made the brave move to form Motive Studios with Electronic Arts, where she’s currently developing original new IP. She also oversees PopCap Vancouver and is responsible for the HD Star Wars portfolio across EA. A trailblazer and innovator, during this fireside chat Jade will discuss her journey so far as a dev, her views on the future for her and the industry.